The razor that raised the blade count to 3, the original Mach3. 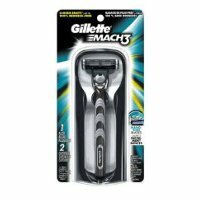 Its 3-blade technology offers both a comfortable shave & the longevity that comes only with exchangeable cartridges. Its Comfort Guard includes 5 Microfins to bring you a close, comfortable shave, and the Indicator Lubrication Strip fades to white to show when you are no longer getting an optimal shave.